Christmas has always been a fun excuse to celebrate with parties, music, friends, family and all the joy of the season. Exlpore this section of the website to discover photos, cards, music and several other ways we celebrate the season. Christmas Party Photos – Photos from Jeff's Christmas parties through the years. 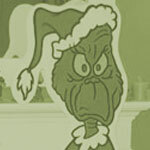 Christmas E-Cards – Old Christmas e-cards sent to family and clients. Christmas LPs – Digitized thrift stores finds to share with people who once owned them. Name That Christmas Special – Christmas collecting - now in video form! See a review site the grew out of Jeff's annual Facebook game.